Wow- what a sight! This 155cm Santa is stunning and will bring a smile to the face of everyone who sees it. 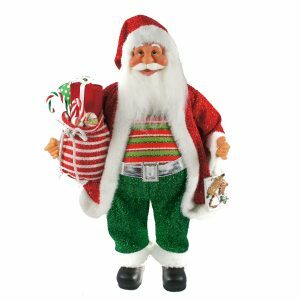 Imagine how enchanting it will be to park this perfect Santa near your Christmas tree, or to perch him by your front door before a holiday party. This Santa is tall, and is crafted with life-like details that add to his allure. He wears a beautiful red flocked suit, and he has the same fluffy beard and trims that you would expect. He carries a green velveteen bag over one shoulder, overflowing with brightly coloured gifts. He is free-standing and will retract into himself for easy storage when the holidays have passed. This would be a captivating focal point for your home or office during the festive season, and needs little other decorations to create a whimsical display. Enjoy the simple pleasures of this special season, including this 155cm tall Santa figure! He will soon become a favourite with the whole family, young and old alike!